AIR-Pros to Visit the Festival of Flight! Aircraft of all kinds will be flying in to Suffolk Executive Airport (SFQ) this weekend for the Virginia Festival of Flight. This annual event runs from 8AM-5PM on Saturday and 8AM to 4PM on Sunday. Regional representative for Aviation Insurance Resources, Gregg Ellsworth, is excited to attend for his fourth year in a row. “My favorite part of the event is seeing familiar faces, as well as meeting new pilots. I love seeing all the aircraft on display and the ones flying in,” said Gregg. Gregg will be running the AIR booth in the indoor exhibit area. He is excited to offer free quotes and will be available to answer any questions pilots may have regarding their insurance needs. “Come see me if you’re looking for the best insurance rates,” added Gregg. AIR is a grass roots agency that loves to meet its present and future clients in person. If you are in the area, stop by the Virginia Festival of Flight this weekend to say “hi” to Gregg! Posted in Uncategorized | Comments Off on AIR-Pros to Visit the Festival of Flight! Service with integrity from the professionals you know and trust. The date and time of Jon Harden’s firing is still clear in his memory. What wasn’t so clear at 10:30 a.m. on Nov. 16, 1998, were the opportunities that were about to open up for Harden, and the brand-new business he would launch as a result: Aviation Insurance Resources (AIR), or AIR-PROS. Harden had been in charge of aviation insurer Avemco’s regional sales offices, and before he knew it, the company launched a corporate restructuring that eliminated the entire network. Harden was convinced then, as he is now, that experienced aviation insurance agents with direct personal knowledge of their customers, provide the best service, lowest prices and lowest risks for insurers. A few weeks after being escorted out of Avemco’s headquarters in Frederick, Maryland, Harden assembled a team of experienced former colleagues committed to providing the highest personal service to GA clients. All of his current team had been similarly displaced. Instead of bringing them to one central office, however, Harden kept them in place, just as they had been at Avemco. Harden founded AIR in 1999. The company has 15 employees working in four regional offices: Frederick, Maryland; Orlando, Florida; Thousand Oaks, California, and Bradford, Pennsylvania. All AIR agents are GA pilots, and many own their own aircraft. AIR is licensed to do business in all 50 states. It started from the ground and has grown into one of the country’s largest GA insurance agencies. Harden has had many opportunities to branch out into auto, marine, or other types of insurance but always resists. “We’re committed to aviation, and aviation will remain our sole focus,” he says. “Our commitment goes a long way with our customers; it’s what sets us apart from the competition,” adds AIR Regional Vice President and commercial pilot Chris Wolbert. Despite two challenging years for the broader aviation industry in 2008 and 2009, AIR has continued to expand the number of policies it writes, which is mostly through word-of-mouth recommendations from its existing customers. In recent years, AIR has moved aggressively to convince insurance underwriters to back the fledgling Light Sport Aircraft (LSA) category. The company even helped structure and sell some of the first policies for LSA flight schools. “I’m proud of the work we did helping LSA flight schools get started,” he says. 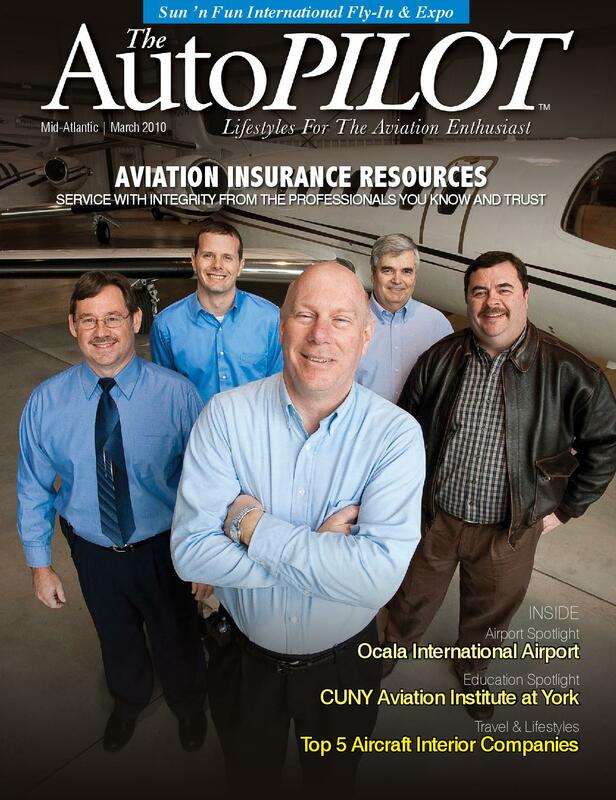 “It’s going to be good for the aviation industry in the long-run because the lower operational costs of LSAs are going to attract more people to aviation.” AIR also writes policies for turbine aircraft owners, FBOs, corporate flight departments, flight schools and charter operations. The company exhibits annually at both Oshkosh, Wisconsin’s EAA AirVenture and Sebring, Florida’s U.S. Sport Aviation Expo. It also attends AOPA’s Aviation Summit; NBAA’s conventions; and Lakeland, Florida’s Sun ’n Fun International Fly-In & Expo in addition to many regional fly-ins. Furthermore, Harden says an influx of new insurance underwriters has lowered premiums dramatically for turbine aircraft in the last three years, with premiums falling 25 to 50 percent during this period. A similar trend has reduced insurance costs for piston aircraft owners too but not nearly so steeply. According to Harden, insurance costs for consumers have stabilized and are unlikely to sharply move up or down for the foreseeable future. “I don’t see any dramatic changes on the horizon for either the turbine or piston market,” he says. Aircraft owners are advised to evaluate aviation insurance agents carefully and find one they trust and who has extensive industry knowledge. AIR has access to a spectrum of large and small insurance underwriters, and Harden’s agents work hard to find the best possible options for customers, whether the agents are writing new policies or renewing existing ones. “One call to us allows a customer to shop the entire market,” says Harden. “Although we’re large, we treat our customers like we’re a small company,” adds AIR agent and private pilot Gregg Ellsworth. AIR’s steady growth continues to be gaining one customer at a time through one referral at a time. As part of AIR’s growth, it’s acquired agencies over the years and would consider obtaining others in the future; however, AIR is extremely selective. "New Lower Renter/Non-Owned Aircraft Insurance Rates"
Personal Non-owned Aircraft Liability Protection for You and Your Family When You Borrow or Rent an Aircraft! Flying non-owned Multi-Engine or Helicopters? Call for quote.